The innovation of wireless technology encourages application of wireless communications to industry. Industrial communication networks require strict features such as robustness, real-time responsiveness, and low power consumption. 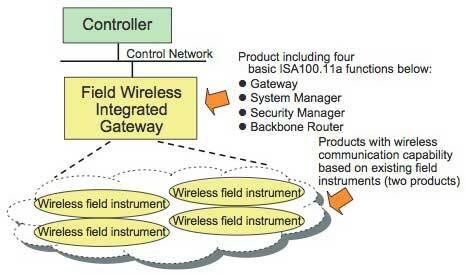 ISA100.11a, an international wireless communication standard for industry, is designed to realize these capabilities. Yokogawa has commercialized the world's first two wireless field instruments and a device for field wireless systems based on the ISA100.11a with huge potentials, excellent expandability, and high affinity with process control. This report introduces these three products. The innovation of wireless technology increases the use of wireless communication in the industry. The introduction of wireless communication to plants, however, requires strict features such as robustness, real-time responsiveness, and low power consumption. This has restricted the use of wireless communication to limited applications such as data logging and device status monitoring that does not require strict real-time responsiveness and data arrival reliability in communication. However, ISA100.11a, a wireless communication standard for industrial automation, which could realize such strict features was published in September 20091. In response to that, in June 2010 Yokogawa released the world's first two wireless field instruments and a device for field wireless systems based on the ISA100.11a. This report introduces the features and capabilities of these wireless instruments and a wireless device for field wireless systems. 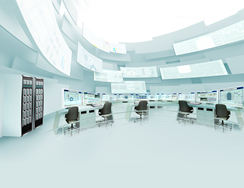 Yokogawa has developed the following three products based on the ISA100.11a standard. Figure 1 shows the external view of these products. 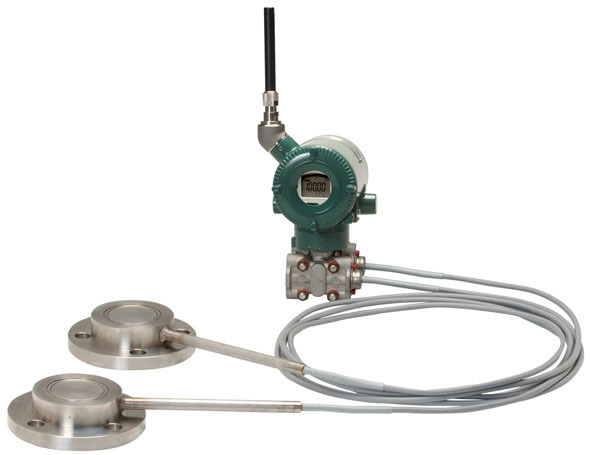 Yokogawa has newly developed EJX B series differential pressure/pressure transmitters with a wireless communication function based on the ISA100.11a in addition to the popular EJX A series differential pressure/pressure transmitters2. Yokogawa has newly developed a YTA510 temperature transmitter with a wireless communication function based on the ISA100.11a in addition to the two-wire YTA temperature transmitter3. 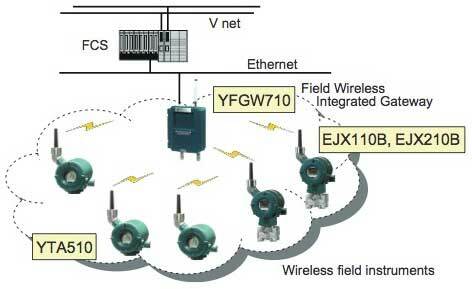 Yokogawa has developed the YFGW710 Field Wireless Integrated Gateway for wireless network systems based on ISA100.11a. Four functions specified by the ISA100.11a standard described later were integrated into the YFGW710: the functions of the gateway, system manager, security manager, and backbone router. The EJX B series is already certified by the ISA100 Wireless Compliance Institute (WCI). Other models will also undergo evaluation tests and be certified one by one. Figure 2 shows the correspondence between the system specified by the ISA100.11a standard and the newly developed products. The following four functions specified by the ISA100.11a are integrated in the YFGW710. The gateway provides an interface function between upper systems such as a controller and the ISA100.11a network. It performs upper system application-dependent processing. The system manager provides a function to manage and control operations of the ISA100.11a wireless network such as communication periods of field instruments and communication error handling. This is one of the extremely significant functions to determine ISA100.11a wireless communication performance. The performance and characteristics are not specified by the ISA100.11a standard but vary depending on the vendor. The security manager provides a function to ensure the security of field wireless communication in conjunction with the system manager. It manages the distribution and update of security keys, authentication of devices, and others. The backbone router is an access point to connect the field wireless instruments to the backbone network, and provides an interface to connect them to the gateway, a routing function to allow the field wireless instruments to communicate via the backbone network, and others. The communication media and protocol of the backbone network is not specified, but the IP is the most promising protocol. Figure 3 shows a typical connection with the field control station (FCS) of Yokogawa's distributed control system (DCS) CENTUM VP. The communication with the FCS utilizes Modbus/TCP, a Modbus protocolNote 1) implemented on top of the Ethernet TCP/IP protocol. Since field wireless devices are equipped with built- in batteries and the communication with the upper system is wireless, wiring is not required. This makes it possible to reduce installation costs remarkably and facilitates new applications. For details, please refer to the report entitled "Field Wireless Solution Based on the ISA100.11a to Innovate Instrumentation" in this special issue of Yokogawa Technical Reports. The following describes the specifications and features common in the three newly developed products, and those of the individual products. Wireless Communication Features of ISA100-based Products The three newly developed products utilize the same wireless modules and have the same wireless communication features. Table 1 shows the major wireless specifications. The antennas of the EJX B series and YTA510 have the physically same design. *1: Common key encryption method developed as the Advanced Encryption Standard (AES) in the USA. A new battery pack has been developed to enable replacement of the batteries in the field. This battery pack can be used for both the EJX B series differential pressure/ pressure transmitters and YTA510 temperature transmitter. Figure 4 shows the external view of the newly developed battery pack and the battery replacing procedure. This procedure makes it possible to replace the battery pack in hazardous areas. In order to reuse the case, the battery pack is designed so that batteries inside can be taken out and replaced. Large-capacity lithium-thionyl chloride batteries that are general- use and readily available in the market were adopted. The EJX B series inherits the features of the existing EJX series, such as the high reliability of the sensor, multi-sensing function, and enhanced self-diagnostic functions, as they are. A low-power consumption design was implemented in order to extend the life of the built-in batteries, while keeping the capabilities and functions of existing ones. Table 2 shows the major specifications of the EJX110B differential pressure transmitters. Battery life 4 years under the following typical operating conditions. 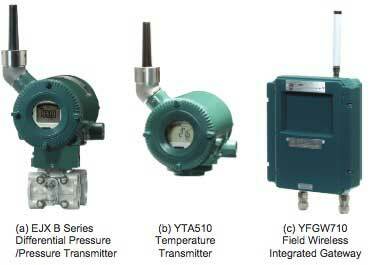 To meet various applications, Yokogawa has lined up a variety of transmitter models, such as a differential pressure transmitter, pressure transmitter, absolute pressure transmitter, flange mounted differential pressure transmitter, screw- mount pressure transmitter, and diaphragm sealed differential pressure/pressure transmitter. The YTA510 is a high performance temperature transmitter that accepts various signals: inputs from IEC standard thermocouples (eight types including Type K, E, and J are applicable), inputs from IEC or other standard resistance temperature detectors (RTD) (three types including Pt100 are applicable), DC current corresponding to resistance, and DC milivolts. It converts them to values corresponding to the measured values and sends to the upper system via wireless communication. Furthermore, it sends and receives diagnostic information of devices and settings parameters via wireless communication. The robust design and stable characteristics ensure stable field operations as well as a two-wire YTA series does. Table 3 shows the major specifications. Accuracy Pt100 ± 0.3°C, Type K ± 0.6°C, etc. Battery life 6 years under the following typical operating conditions. A power-saving design was implemented for the YTA510 in order to extend the life of the built-in batteries which are required for wireless communication. Furthermore, since the temperature transmitter is required to be installed near the measurement location, it was designed so that the input wire length can be minimized. In addition, the temperature conversion circuit was newly designed to optimize the wireless operations. The following describes the features of the YFGW710. Table 4 shows the major specifications of the YFGW710 Integrated Gateway. The YFGW710 is connected with the upper system using an Ethernet 100BASE-TX metal or 100BASE-FX optic fiber cable. The fiber optic cable ensures stable communication even in an electromagnetically noisy environment. The Modbus/TCP protocol was adopted for communication with the upper layer. The Modbus/TCP is widely used in the industry and enables connection between various upper systems and wireless field instruments. Applying the non-incendive and Type N explosion protection design, the required explosion protection specification was satisfied without using an explosion-proof enclosure, and the reduction of the size and weight of the unit was achieved. As for the degrees of protection of the housing, IP66 in IEC 60529 and NEMA 4X were achieved, and so the unit can be installed in a harsh environment. A rated voltage of 24 VDC is recommended. However, the design voltage range is from 10.0 to 26.4 VDC to enable operation at a voltage of 12 VDC. A standard structure where the antenna is connected to the main body directly and an optional structure where the antenna is connected to the end of the extension cable are provided. Both structures meet the required explosion protection specification. The antenna can be installed in a better communication environment away from the main body using the extension, preventing the deterioration of the communication performance even where many obstacles surround the main body. The three newly developed products utilize wireless modules that have higher receive sensitivity than that of Yokogawa's existing wireless products in order to improve wireless communication performance. Increased receive sensitivity makes it possible to build a wireless communication infrastructure with higher performance and wider communication range in a plant environment where there is considerable radio reflection. Consequently, this helps to reduce the number of repeaters, extend the wireless communication range, and ensure communication stability in the plant environment. 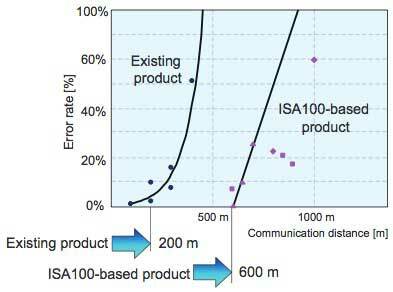 Figure 5 shows the experimental results of communication distances of the newly developed ISA100-based wireless products and Yokogawa's existing wireless products based on another standard. The communication distance of the ISA100-based products is approximately three times as long as that of the existing wireless products. The extended communication range makes it possible to configure a wide star topology network that does not require hoppings (relaying between the wireless devices), which are required in the mesh topology network. A star topology network is superior in stability and real-time responsiveness which are required in the plant. In addition, eliminating the need for hopping means that no relaying communication is required, extending the life of the built-in batteries. Yokogawa has released the world's first products based on the ISA100.11a standard: the EJX B series differential pressure/pressure transmitters, YTA510 temperature transmitter, and YFGW710 Field Wireless Integrated Gateway. Furthermore, in order to maximize the use of these products, Yokogawa is carrying out experiments in the field for various applications and accumulating the operation results of field wireless systems. Yokogawa is accumulating the experience and success stories in applications with a wide field area of the plant where especially wireless communication is effective; namely, at off-sites, in tank yards, coal storage yards, water discharge and intake facilities, oil wells, and the like. Yokogawa plans to enhance the performance of these three models, deploy those technologies to other field instruments, and introduce or develop new technologies such as Wi-FiNote 2) communication that would improve the performance and convenience of wireless systems. At present, Yokogawa uses batteries to supply power to the field wireless instruments but plans to develop energy harvesting technology that captures energy from external sources such as sunlight, heat, vibrations, or electromagnetic waves to supply power to the field instruments. Wi-Fi and Modbus are registered trademarks of Wi-Fi Alliance and AEG Schneider, respectively. Note 2) Abbreviation of Wireless Fidelity, indicating that the interconnectivity between the wireless LAN devices is certified by Wi-Fi Alliance.